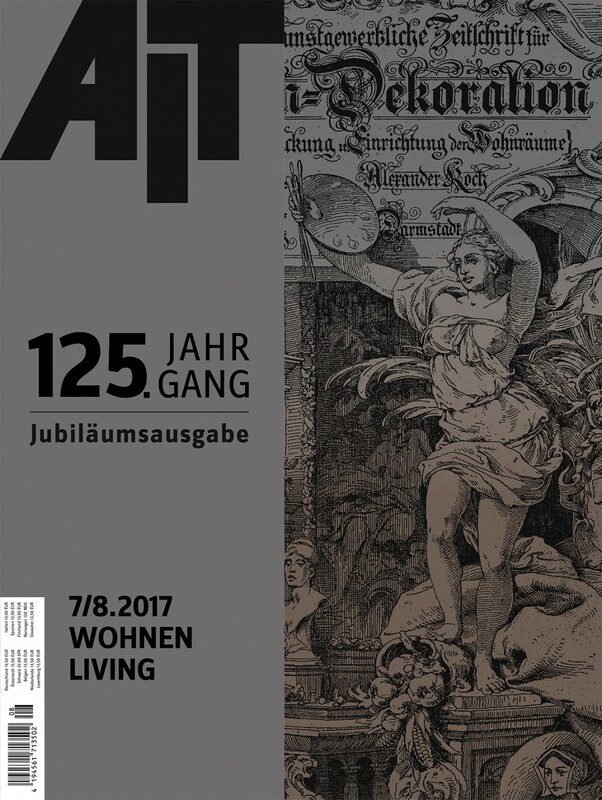 “ANOTHER VENICE”, ristrutturazione di un edificio storico ad uso residenziale a Venezia, è stata pubblicata sul numero di Luglio di AIT – Germania, con un bell’articolo di Christine Schröder. In the middle of Venice architects Andrea Marcante and Adelaide Testa revived a 19th century building. Besides the renovation of apartments, the architects from Turin were also commissioned with the layout of the semi-public circulation. In the first already completed apartment, space-forming structures built of metal profiles play a primary role. 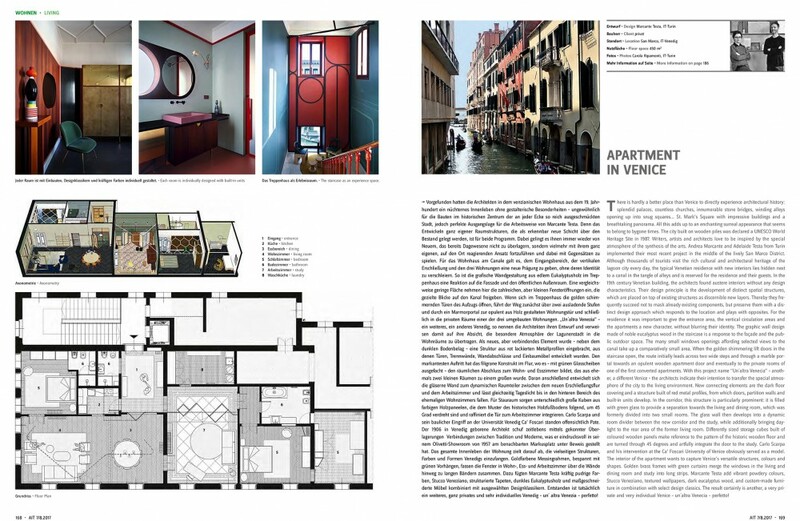 These are complemented with numerous references to the lagoon city spreading out in front of the windows, which create “Un´altra Venezia” – another, a different Venice. There is hardly a better place than Venice to directly experience architectural history: splendid palaces, countless churches, innumerable stone bridges, winding alleys opening up into snug squares… St. Mark’s Square with impressive buildings and a breathtaking panorama. All this adds up to an enchanting surreal appearance that seems to belong to bygone times. The city built on wooden piles was declared a UNESCO World Heritage Site in 1987. Writers, artists and architects love to be inspired by the special atmosphere of the synthesis of the arts. Andrea Marcante and Adelaide Testa from Turin implemented their most recent project in the middle of the lively San Marco District. Although thousands of tourists visit the rich cultural and architectural heritage of the lagoon city every day, the typical Venetian residence with new interiors lies hidden next to a canal in the tangle of alleys and is reserved for the residence and their guests. In the 19th century Venetian building, the architects found austere interiors without any design characteristics. Their design principle is the development of distinct spatial structures, which are placed on top of existing structures as discernible new layers. Thereby they frequently succeed not to mask already existing components, but preserve them with a distinct design approach which responds to the location and plays with opposites. For the residence it was important to give the entrance area, the vertical circulation areas and the apartments a new character, without blurring their identity. The graphic wall design made of noble eucalyptus wood in the staircase is a response to the façade and the public outdoor space. The many small windows openings affording selected views to the canal take up a comparatively small area. 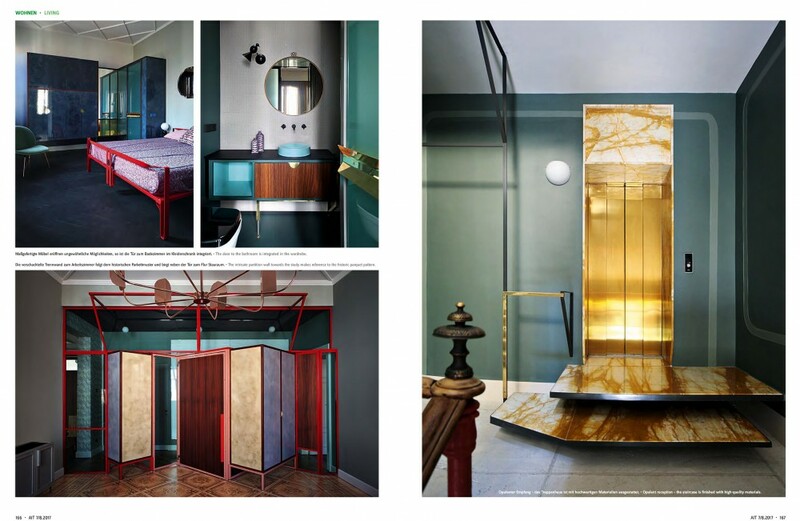 When the golden shimmering lift doors in the staircase open, the route initially leads across two wide steps and through a marble portal towards an opulent wooden apartment door and eventually to the private rooms of one of the first converted apartments. With this project name “Un´altra Venezia” – another, a different Venice – the architects indicate their intention to transfer the special atmosphere of the city to the living environment. New connecting elements are the dark floor covering and a structure built of red metal profiles, from which doors, partition walls and built-in units develop. In the corridor, this structure is particularly prominent: it is filled with green glass to provide a separation towards the living and dining room, which was formerly divided into two small rooms. The glass wall then develops into a dynamic room divider between the new corridor and the study, while additionally bringing daylight to the rear area of the former living room. Differently sized storage cubes built of coloured wooden panels make reference to the pattern of the historic wooden floor and are turned through 45 degrees and artfully integrate the door to the study. Carlo Scarpa and his intervention at the Ca’ Foscari University of Venice obviously served as a model. 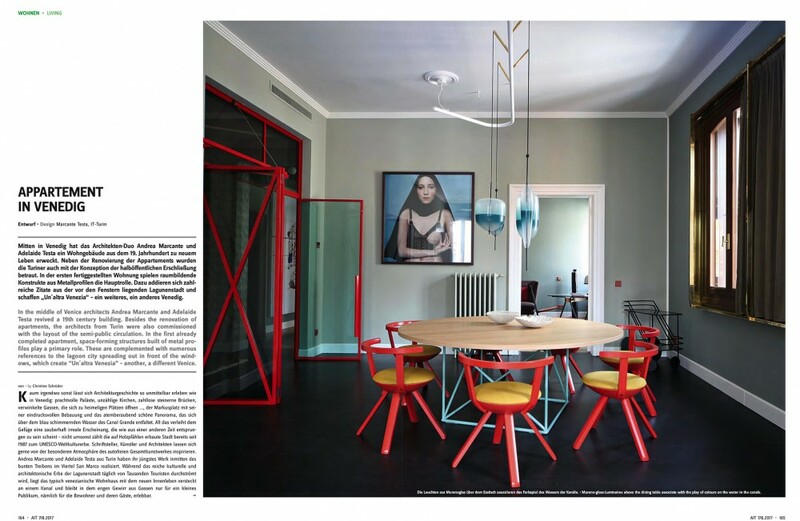 The interior of the apartment wants to capture Venice’s versatile structures, colours and shapes. Golden brass frames with green curtains merge the windows in the living and dining room and study into long strips. Marcante Testa add vibrant powdery colours, Stucco Veneziano, textured wallpapers, dark eucalyptus wood, and custom-made furniture in combination with select design classics. The result certainly is another, a very private and very individual Venice – un´altra Venezia – perfetto!